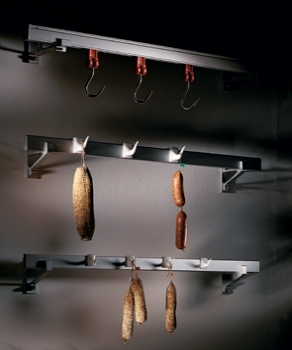 Our hook hangers are widely used to hang up salami, ham or cheese and display them in butchers, supermarkets and delicateness. “AI” hooked bars for meat hanging are made from anodised aluminium alloy and are designed to support a wide range of load capacities. The hook hangers are available either with sliding hooks or fixed hooks, with different brackets for wall installation or ceiling installation.